The Hunters were the smallest group and at the top of the food chain, but the wolves of the Pack could band together to challenge them. The Prey animals were doomed to be food and could not defeat either predator, but could form Herds to pool their strength and could still win the day through cunning and superior tactics. Forces of Nature roamed the jungle, causing harm to all they were able to catch. Given that a large number of them were riding mountain bikes, they presented a serious threat. Man could be found throughout the game area. Any animal encountering them would randomly encounter one of three people: Buldeo the hunter, Messua the helper, or Toomai the healer – the latter only helping if the correct price was paid. Man did not have it their own way however, with each Hunter having the opportunity to become a Man-Eater. This risky opportunity was taken twice, resulting in a coordinated and resolute hunt for the culprits. It was truly an interesting weekend. A recent back-burning operation had resulted in certain areas of the Orienteering Course producing very dirty Scouts – although it must be admitted that a large number of these Scouts looked as though the dirt and soot had been added deliberately! Entrepreneurs abounded – as did conmen and “creative” approaches to the various problems and missions the game presented to the Patrols. Many Patrols displayed unexpected tactics and initiative and succeeded in ways we didn’t expect, often to the frustration (and sometimes respect) of their pursuers. Well done to them all! The Figtree Patrol who managed to smuggle “The King’s Ankus” past the Venturers by stuffing it down the pants leg of one of their members. This was impressive as the “Ankus” was made of iron, over a metre long and weighed a considerable amount. The Southwell Patrol Leader whose shameless wheeling and dealing impressed all who came near him, and enabled his Patrol to be one of only two Prey Patrols to manage to end up having more “lives” than their starting amount. The Keiraville Patrol who managed to locate and rescue “Mowgli” (a large pink teddy bear) twice in the space of as many hours – despite him being concealed in a different supposedly secret location each time. The Jamberoo and Keiraville Patrols who became Man Eaters and evaded the resulting intense hunt for over 45 minutes each. The finalists collected from these groups were 1st Jamberoo Awesomes, 1st Keiraville Albatrosses, 1st Warilla Spiders, 1st Keiraville Kingfishers, 1st Figtree Eagles, and 1st Keiraville Hawks. The proud holders of the wooden spoon were 1st Albion Park Slack Jawed Yokels, now members of a very elite group of fellow recipients. Winners of the Venturer award were 1st Balgownie. Thanks go to ALL the Venturers, who made up an impressive contingent. Nearly 40 of them turned up to help run the event, proving that the appealing of hunting Scouts remains as powerful as ever, and that sleep is truly for the weak! The Organisers remain grateful for their assistance, as the WWG could not run without their help. Recognition must also be made to the other dedicated organisers who helped produce this event: Bob Nightingale, Rob Chincella, Tristan Haider, and Catherine Ruskin. Much appreciated assistance was also received from representatives of nearly every one of the SC&T Rover Crews. A final special thanks also go to Snowgum, who very generously donated prizes and material to the event. 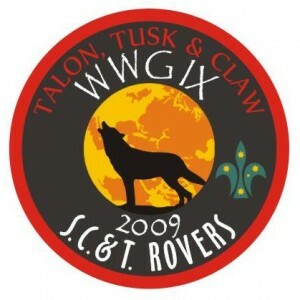 On behalf of the SC&T Rovers and the WWG Committee, thank you all for coming, and I look forward to seeing you next year.